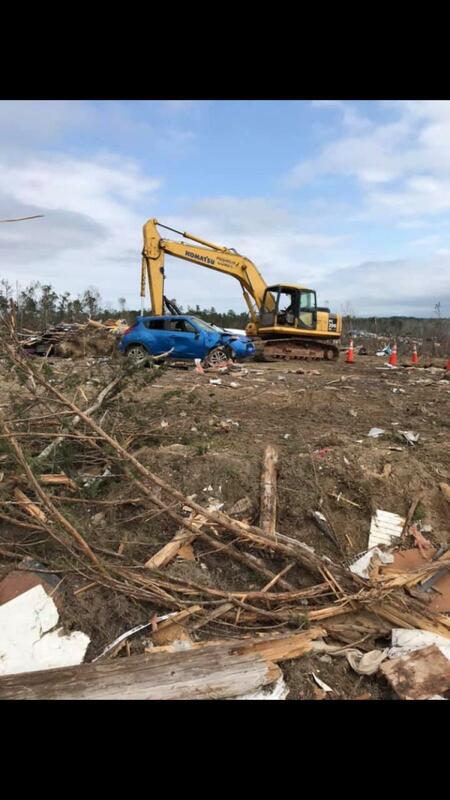 As part of a powerful storm system that also tore through the Florida panhandle, South Carolina and Georgia, devastating tornadoes decimated parts of eastern Alabama during the first week of March, killing 23, injuring dozens more and leading Gov. Kay Ivey to declare a state of emergency. First responders were on site almost immediately as the Federal Emergency Management Agency quickly turned out to organize a search for the missing and the state government assessed the damage and released contracts for construction. Chainsaws and generators proliferated in the area, but the most predominant pieces of equipment in use were skid steers equipped with grapples. 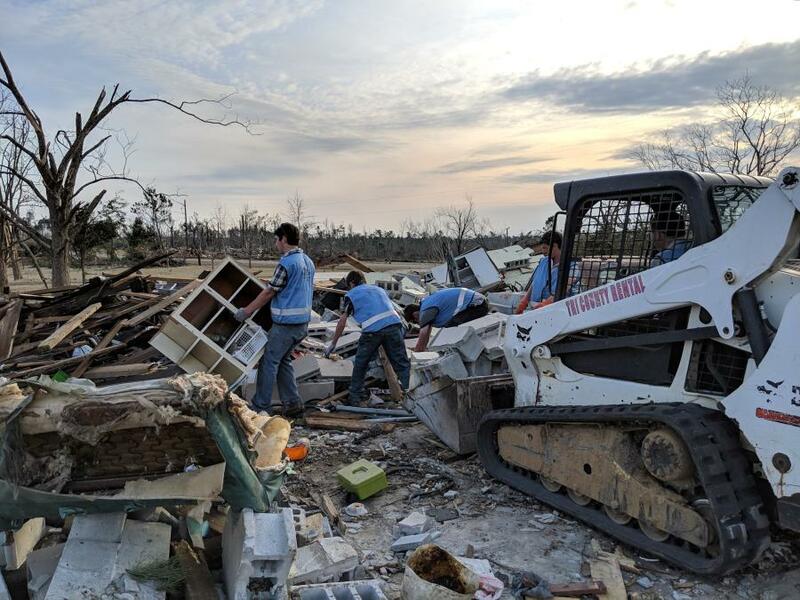 The Rapid Response Team of the Christian Aid Ministries brought in three skid steers, said Paul Kim Eichorn, country supervisor and liaison based in the ministries' Ohio office, who was responsible for sending teams from different states to the disaster sites, where they focused on helping the elderly, widows and the handicapped by cutting and clearing trees and debris from their homes. Rubble had to be moved to the right of way before FEMA could haul it away. While it was the homeowners' responsibility to move it there, not all homeowners are able to do so. "The Alabama EMA clears the roads," Eichorn said. "We get trees off houses and tarp the roofs so houses don't get damaged by the rain." Using chainsaws, the teams removed trees from driveways and yards. In addition, they provided meals, necessary hygiene and other donated items, emotional support and assistance in arranging housing for displaced victims and families in need. According to radar and video evidence gathered by the National Weather Service, several tornadoes touched down in Lee County, reaching up to category 4 on the Enhanced Fujita Scale and packing winds as strong as 170 mph. The affected area in Lee County was estimated to be almost a mi. wide and 24 mi. long. The tornadoes were the country's deadliest since May 20, 2013, when 24 people in Moore, Okla., were killed by an EF5 tornado. Local news reports quoted Sheriff Jay Jones describing "massive damage" to buildings and stating that many homes were completely destroyed. Thompson Tractor Cat Rental in Opelika, Ala., also provided several skid steers with grapples, but, according to Will Watson, rental coordinator, most of the equipment used to clear debris was owned by local contractors such as B&J Enterprises and Hudmon Construction Co. Inc., which also sent employees to help. Hudmon sent a large Komatsu excavator and a skid steer on Day 1 — a chilly 32-degree day — to assist in the effort. 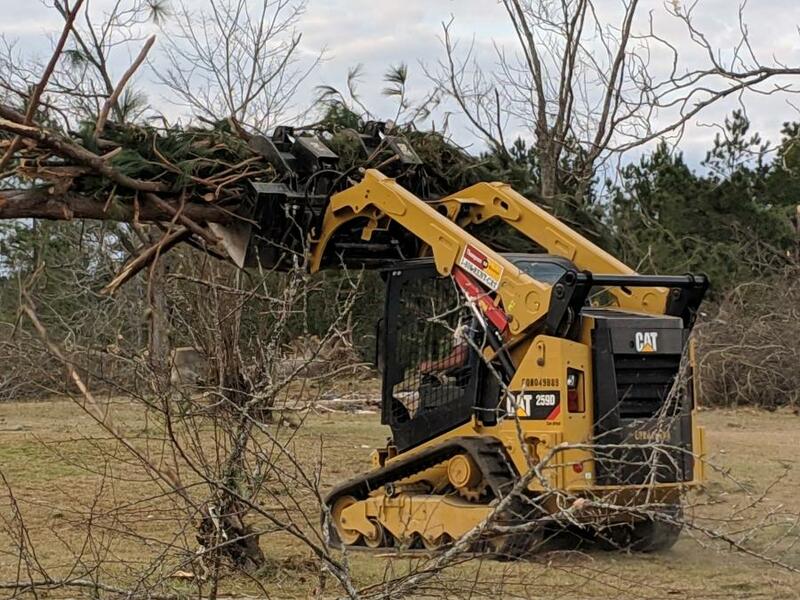 "We assisted the fire department," said Brandon Clifton, Hudmon's general manager, who personally operated equipment, clearing tree limbs, brush and portions of houses destroyed by the storm in order to allow crews to search for survivors. 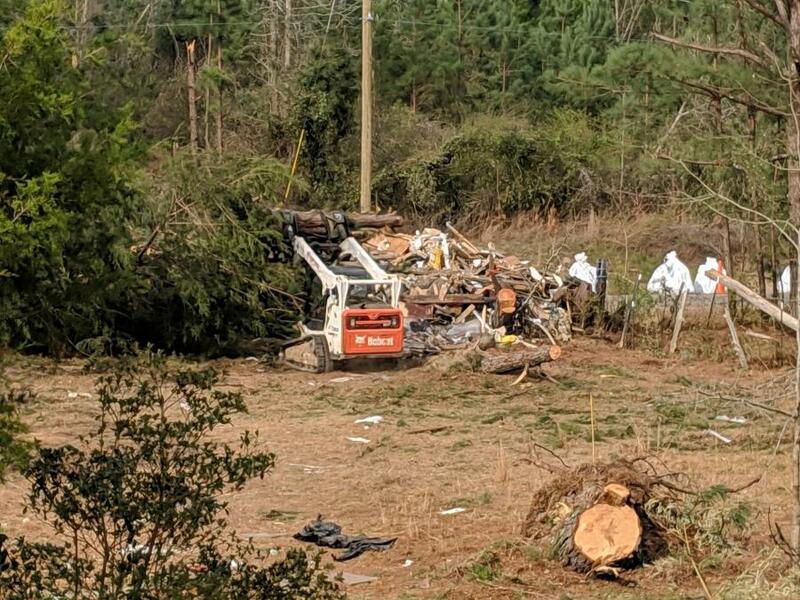 Fortunately, the significant rainfall that accompanied the tornadoes did not impede cleanup operations, and equipment was able to access the area without getting bogged down. Shifting focus to the affected area 10 mi. away from its headquarters in Opelika, Ala., forced Hudson to "pretty much shut down operations" while dealing with tornado damage, Clifton said. The company's clients have been understanding, however, with one customer in Florida telling Hudmon that his job could wait while the work in Lee County went on. Clifton estimated that 10 of the tornado victims had direct connections to his company. The roof of Hudmon's secretary's house was blown off, he said, but the most tragic losses were visited on one of the company's mechanics, David Grimes, who lost his brother Lynn and Lynn's fiancée, and whose niece was hospitalized. Grimes, who spent a great deal of time operating equipment during the rescue and recovery efforts, was embraced by President Trump during his visit to the ravaged site. "We're helping out our employee and our community," Clifton said. "They call us the Bible Belt for a reason." Initially, Hudmon worked side by side with some of its competitors, but there were "so many other folks down here" to help with cleanup, Clifton said, that Hudmon is no longer on site. However, it left equipment behind to assist the county with cleanup. "It's on loan," Clifton said. "We wouldn't take a dime for it." To date, nearly $1 million has been donated for relief efforts.